Sorry, we've been very bad about blogging for the last couple of weeks. 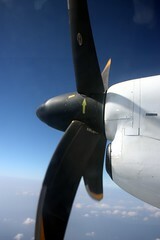 We flew down to Vientiane, capital of Laos, in a tiny little turbo-prop plane which was quite cool. It's only a couple of hundred kilometres but would have been a ten hour bus journey - we were sick of buses, even split into two five hour journeys it seemed too much. We made enquiries about a four day cycle tour that covers the journey, but it turned out to be insanely expensive. It was a shame to miss the pretty mountain scenery south of Luang Prabang, it looked nice from the air. Vientiane started out with a long hot trek around town at midday, my backpack now a bit heavier thanks to all the market shopping. We found and rejected lots of expensive rooms, and lots of cheap ones that smelled bad before finding one that was moderately priced and not smelly. 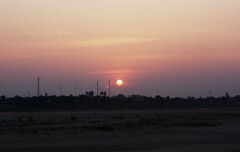 Vientiane is very chilled for a capital city. It's next to the Mekong river but not quite on it. At first it appeared to be a very long way from the river, then we realised that it's the dry season and the huge flat sandy bit is probably a huge rivery wet bit for much of the year. On top of that, there's an extra couple of hundred metres of land which is currently being landscaped into a park, and a levee behind that to protect the city against flooding. It also has some of the most consistently fantastic sunsets I've seen anywhere - the sun dims and changes colour as it drops over the river, until it becomes a large red disc and sinks into the haze a few degrees above the horizon. I walked out across the sandy riverbed one evening, ending up with several spoonfuls of fine dusty sand in my trainers, and was rewarded with a lovely peaceful spot in which to watch the sunset. We headed away from the river in the evenings and bought our dinner from the night market, coming away with delicious curries, sticky rice, barbequed meats, steamed leafy green veg and larger savoury versions of the little rice treats we'd found in LP. (We have since found out that these are called Khanom Krok and are also available throughout Thailand). There was also what looked like a dessert stall selling various interesting looking cake-like things. I pointed and asked "All sweet?" The vendor nodded, which turned out to be approximately half right. Among our selection of goodies, one contained a sliver of alarmingly pink sausage. Another, to our delight, was an exact miniature version of a Cornish pasty. The shape, taste and smell were spot on! Hotel breakfast was typically grim but we went a couple of doors down to an excellent French bakery and coffee shop - what with spending so little on our market dinners, we felt justified in splurging a little bit on fancy pastries and coffee first thing. 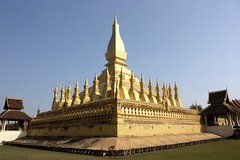 We walked out to visit the giant gold stupa one day, it's the national symbol of Laos and is pictured on the bank notes. It turned out not to be made of solid gold or even gold plated, just painted with gold paint and also quite dirty - but it was a fun trip and we also passed Vientiane's concrete equivalent of the Arc de Triomphe. After a couple of days we caught the bus across the river over the Friendship Bridge, back into Thailand, we were unloaded once for exiting Laos and once again for entering Thailand at the other end of the bridge, passing lots of scary signs about all the horrible things they will do to you if they find bad stuff in your bags. We were excited about coming back into Thailand again but it also felt like we were beginning our journey home. I do hope to see more of Laos at some point - there's plenty more to see but we also wanted to spend some more time in Thailand.